On a clear day from Earth, the Sun appears to be a perfect yellow sphere. Its intense brightness makes it very difficult to make out any of its features and attempting to do so is also very dangerous. However, with the right equipment, it is possible to get a clearer look at the Sun, and doing so reveals that scattered across its visible surface (the photosphere) are dark spots. These spots are called sunspots. Temperatures in sunspots are much cooler than elsewhere on the Sun. Usually the Sun's surface temperature is about 5,500 °C (9,900 °F) but in sunspots, the temperature is between 2,700 °C to 4,200 °C (4,900 °F to 7,600 °F). Even in these cooler regions, temperatures are still thousands of times hotter than those ever experienced on Earth. And even though sunspots are dark areas, they are only dark in comparison to the rest of the Sun. If you were able to see just the sunspot and no other part of the Sun, a sunspot would actually be as bright as a full moon. Take a look at the image below to demonstrate this. If you look at the two small squares inside the larger circles, which of the two squares appears darkest? Hover over the picture to see if you are correct. 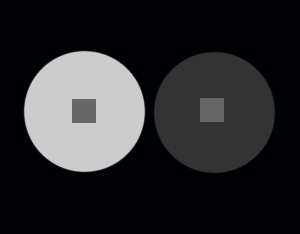 What you should notice is that although the square in the left circle appears darkest (perhaps even as dark as the circle on the right), both squares are actually the same colour. The reason the square on the left appears darkest is because it is surrounded by a bright object. When the bright object is removed, the square is revealed to be a light grey colour, identical to the square on the right. Sunspots have been observed on the Sun for centuries. Over 2000 years ago, ancient Chinese astronomers recorded observations of sunspots, and not much later the ancient Greeks also noted them. Although astronomers were able to see these small dark markings on the Sun's disc, it wasn't clear what they actually were. Some astronomers believed them to be planets travelling past the surface of the Sun, like Mercury and Venus do, but as technology progressed and people were able to observe the Sun safely and more clearly, it became obvious that the dark areas were actually markings on the Sun's surface. And as they appeared to move across the Sun's surface, they supported the theory that the Sun spins. Sunspots can vary greatly in size and the length of time that they are present for. They can be quite small (about the size of the Moon) to several times larger than Earth, up to 80,000 kilometres (50,000 miles). A sunspot can be present on the Sun for anything from a few days to several months. 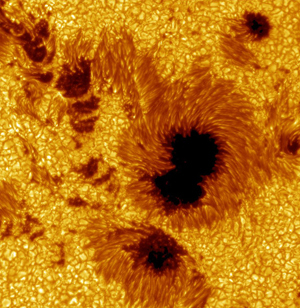 The image above to the left is a close-up of a collection of sunspots. The largest in the image is several times larger than Earth. The darkest part of the spot is called the umbra and the slightly lighter area surrounding it is called the penumbra. Small sunspots without penumbras are called pores. The Sun, like many objects in the Solar System (including Earth) has a magnetic field. A magnetic field is basically invisible magnetic lines (flux) travelling into and out of the Sun produced by electrically charged particles. These lines would usually travel through the Sun regularly, or, in other words, following the route they took when they entered it. However, as the Sun is a ball of gas, it spins faster towards its equator than towards its poles. This muddled way of spinning (known as differential rotation) disturbs the route of the magnetic field, and causes some of the lines of magnetism to warp and twist. Sometimes they become so distorted that they "snap" like elastic bands and pop out of the Sun's surface. The intense magnetism in these magnetic fields lines is powerful enough to push back some of the hot gases travelling outwards from the Sun. This prevents some of the heat from reaching the surface and causes the area to be cooler. And as heat energy also produces light, areas - or spots - where the Sun is cooler are also darker than other areas, and they become known as sunspots. The Sun goes through an eleven year long cycle of activity which is sometimes known as the solar cycle. A solar cycle starts when the Sun's magnetic activity is at its minimum, which is when there are no, or very few, sunspots visible on the Sun. This part of the solar cycle is called solar minimum and can last for several, even hundreds, of days. As the eleven years of the cycle pass, the Sun's magnetic field becomes more and more disturbed due to the Sun's differential rotation as described above. This causes increased magnetic activity, resulting in more sunspots. The period of maximum activity, which is when there are the most sunspots, is called solar maximum. The solar cycle is marked as ending when another solar minimum (no sunspots) has been reached. Although the cycle is approximately eleven years long, it can be as short as nine years or as long as almost thirteen years. The most recent solar cycle began in May 1996 and ended in January 2008. The current solar cycle began in January 2008. Solar maximum for the current cycle occurred in 2014. Although the Sun currently goes through fairly regular eleven year cycles, it sometimes has prolonged periods of reduced activity, during which very few sunspots can be spotted (boom-boom!) The most recent major long-lasting period of low activity is known as the Maunder Minimum, named in honour of the astronomer Edward W Maunder (1851 - 1928). It occurred between 1645 and 1715, and coincided with a period of intensely cold winters in regions on Earth (particularly in Europe and North America) which is sometimes known as the Little Ice Age. Although it may simply be a coincidence that Earth had extremely cold winters during the Maunder Minimum, the activity of the Sun does have some effects on Earth. The presence of sunspots is a visual sign of areas of increased magnetic activity on the Sun and as well as causing sunspots, the increased activity also causes solar flares. These are blasts of magnetic energy being sent from the Sun and through the solar system. When they reach Earth, they can cause magnetic interference in the Earth atmosphere which can disturb the signals used for communication. This may cause static interference on radio, television or on phones and issues with satellite navigation equipment. On the upside, the disturbances are completely harmless, and they produce beautiful auroras in regions of the Northern Hemisphere and Southern Hemisphere. And making it look as if this website was planned when I put it together, you can read all about solar flares and the auroras in the next section!